The LMS-Patriot Project was launched in April 2008. A fundraising campaign began and the two main frame plates were cut in March 2009, at Corus Steel in the West Midlands. This heralded the start of the construction of the new steam locomotive. The locomotive would later be named 'The Unknown Warrior' when a competition was held in Steam Railway magazine. In the Summer of 2009 the frame plates were delivered to the Llangollen Railway Works who were contracted to assemble the locomotive from parts supplied by the Project. A wide range of workshops and manufacturers around the UK have been involved over the years in the manufacturing and supply of new parts and subsystems, including the Boro Foundry, The South Devon Railway, L.N.W.R Heritage, Tyseley Locomotive Works and a number of other specialised engineering and machining companies. See our partners and sponsors. Orders and specifications for the very many components involved are generally placed by the LMS-Patriot Project team. Fundraising for the new boiler for 'The Unknown Warrior' began in 2012. The boiler for 'The Unknown Warrior' is of traditional construction with a copper firebox and is the first all new standard gauge boiler to be built in the UK since the 1960s. Boiler component manufacture and assembly were initially carried out by LNWR Heritage Crewe and Tyseley Locomotive Works. Continuing progress was made between 2012 and 2017. The smokebox was completed in 2013; the driving wheels were made in 2013 and fitted to the frames a year later. The cylinders were fitted by 2015 and the bogie followed in 2016 - making the engine a 4-6-0 for the first time. Other detailed work on the locomotive chassis continued at Llangollen over this period. More recently, the project has faced major change. In 2017, boiler work stopped at Crewe when LNWR Heritage decided to withdraw from all third party contract work. By the end of 2017 however boiler work had restarted with our new contractors Heritage Boiler Steam Services, now based in Huyton, Merseyside. Then in 2018 the Project Board decided to put the completion of the locomotive chassis out to tender. The partly completed chassis was removed in the Autumn from the Llangollen Workshops to its temporary base at the the Railway Heritage Centre at Crewe. At the time of writing (December 2018) expressions of interest to complete the locomotive had been received from four railway engineering contractors, and the formal invitation to tender was issued just before Christmas 2018. 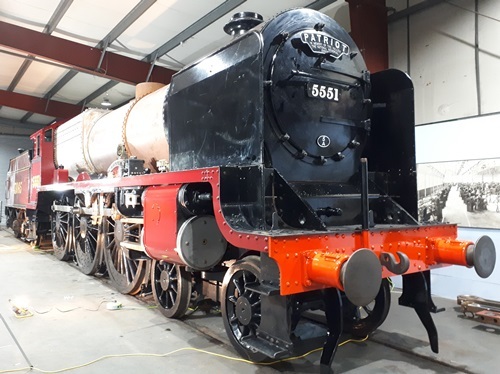 The resulting hiatus in chassis construction work did not prevent a major milestone being achieved in November 2018 - the successful trial fitting, at the first attempt, of the boiler to the chassis at Crewe. After the Great War, three of the then Railway Companies named locomotives to honour the railway employees who had fought and died during the conflict. These were 'Valour', 'Remembrance' and 'Patriot'. The L. & N. W. R. memorial engine, a Claughton class locomotive was named 'Patriot'. This name was later transferred to the new 4-6-0 locomotive number 5500, which became the new 'Patriot' memorial engine for the LMS and after which the class took the name. The new 'Patriot' will be named 'The Unknown Warrior' in keeping with the tradition of war memorial engines. The LMS-Patriot Project aims to continue this tradition in memory of all those brave men and women who courageously served their country. The new locomotive will serve as a permanent memorial to all those who fought and died in the First World War and all subsequent wars. In June 2016, Simon Weston, CBE, the Falklands War Veteran, became the first Patron of the LMS-Patriot Project. On Saturday 10th November 2018 (Armistice Day Centenary weekend), Simon unveiled the new nameplate crest for the locomotive as part of a dedication and remembrance service at Crewe. 'The Unknown Warrior' is being built for main-line running. A high profile engine such 'The Unknown Warrior' in its role as the national memorial engine will be be a huge attraction on the railway network. 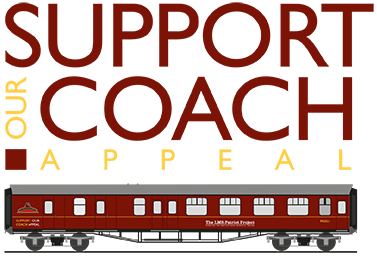 Main-line running will require the locomotive to be built to a height of 13' - 2 ½” less than the original design. The design of the chimney and cab will also be affected by the reduced height requirements. Additional items that are required for mainline running include safety, communication and monitoring systems - AWS, TPWS (and eventually ERTMS), GSM-R and OTMR. These are being factored into our planning. The LMS-Patriot Project is already working with an Engineering Consultancy on main-line certification requirements, and will work with its Train Operator to meet the ROGS (Railways and Other Transport Guided Systems) Regulations governing the introduction of new locomotives. The LMS-Patriot Project was launched by David Bradshaw - a key member of Didcot's Great Western Society 'County' project. Other Directors are Andrew Laws, Richard Sant, Kevin Finnerty, Steve Blackburn, Neil Kinsey, John Hastings-Thomson and Neil Collinson. Kevin West, who is the Project's Draftsman was appointed Chief Menchnical Engineer in 2014. The Project's Administration Office is based at The Hub in Stafford and is staffed by volunteers. The LMS-Patriot Project also has a large number of other volunteer Members involved in various activities including locomotive painting, fundraising, sales and marketing. Members Days are arranged each year at the locomotive assembly base, allowing close-up inspection of progress. Informative quarterly newsletters are produced for Members after each Board Meeting. If you would like to be part of this exciting project to create a new 'Patriot' we would love to hear from you. You can become a member; and setting up a Banker's Order to make regular monthly payments is the easiest and best way to help. If you are a UK taxpayer, we will also be able to claim Gift Aid from the Government if you also send us a completed and signed Gift Aid form. To see how you can help this exciting project please click here.